At state dinner, Peres says that his late father, Yitzhak, as a soldier in the British Army, had been stationed in Greece. The Second World War and the Holocaust figured in the official addresses by both President Shimon Peres and his Greek counterpart President Karolos Papoulias at the state dinner that Peres hosted on Monday night in honor of the president of the Hellenic republic. 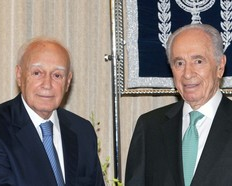 Peres said that his late father, Yitzhak, as a soldier in the British Army, had been stationed in Greece and had been captured by the Germans. He had managed to escape, but finding shelter was difficult because he knew no one in Greece, and not a word of Greek. But he had found his way to a Greek monastery, where for two years, he and six other British soldiers had been hidden by the priests who, at great risk to their own lives, fed them and ensured their safety. After two years in hiding, Yitzhak Perski and the other soldiers decided to make another bid for freedom, and attempted to sail out of Greece on a small dinghy that was quickly intercepted by the Luftwaffe. They were again taken captive by the Germans, who brought them to a POW camp not far from Auschwitz. During the period in which he had been in hiding, Perski had learned to speak Greek and sing Greek songs. When he returned home after a four-year absence, he would frequently gather his children and grandchildren around him to tell them Greek folk tales and sing Greek songs to them. Whenever he hears Yehuda Poliker, the son of Greek Holocaust survivors sing Greek melodies, said Peres, it fills him with emotion, and he is reminded of his late father. Poliker, in fact, was chosen to sing for Papoulias at the dinner, and the Greek head of state later embraced him. Papoulias, who during his visit to Israel met with Greek Holocaust survivors and visited Yad Vashem, said that during the Nazi occupation of Greece, Jews and Christians joined forces in the struggle against the barbarous destruction wrought by the Germans and their cohorts. In the village of Ionnina where he was born, the Nazis murdered ten Jewish families with whom he had grown up. Among the victims was his first girlfriend from elementary school. His voice broke as he recalled how the Nazis had locked the Jews in the synagogue and set fire to it while they were still alive. Greece had paid a heavy toll in blood during the Holocaust, he said. More than 65,000 Greek Jews had been murdered, and the number would have been even higher, had not so many simple Greek Christians put their own lives at risk in order to save the lives of their Jewish friends. He had been very moved, he said, when meeting Greek Holocaust survivors in Jerusalem. The Holocaust is more than the number six million, he said. Behind each victim is a name, a life, a tragedy. This is the reason, he said, that the Greek people, state and community do not turn a blind eye to any incident of anti- Semitism, racism or religious incitement. This is a great story. Too many people think that the Orthodox Church because of what happen in Russia in the early 20th century or earlier that Orthodox are against the Jews. This shows that a lot of Orthodox helped the Jews just like Catholics and Protestants also helped Jews during that terrible time period. Are these brave Greek monks Righteous Among the Nations? I really think they should be. Thank you very much for sharing this story.